Kaye Hall and her identical twin sister, Gaye, were born in McAllen, Texas, and grew up on Texas ranches along with their younger siblings. 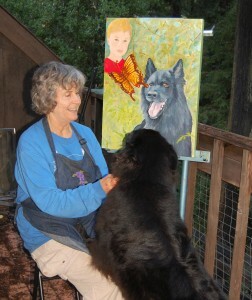 Kaye moved to Napa, California, in 1963, where she lives with her husband and her Belgian Sheepdogs, Julot and Flair.Since winning a drawing contest in the fourth grade, Kaye has been exploring various kinds of art. The beauty of her outdoor environment provides an unending source of inspiration for her artwork. Since retirement from her career as a psychotherapist , Kaye has earned an Associates of Studio Arts Degree with an emphasis on painting and drawing from Napa Valley College and has also recently taken numerous workshops from Francisco Benetiz and other encaustic painters. She has been selected Artist of the Month by the Napa Valley Art Association four times since 2011. She has been juried into the Napa Valley Open Studios. Some of her paintings are displayed at the Artists of the Valley Gallery, 1307 First St. in Napa. Kaye also assists in the search and rescue for missing persons with her trailing dog, Julot. Recently she has combined art and search work by writing, illustrating and publishing a children’s book entitled Stop and Stay Put: A Guide to SAFER Adventures Outdoors. I love being outdoors in nature, and I love dogs. Both nourish me, relax me, and bring me tranquility. Both are varied and full of endless surprises. Both have motion and action. This movement–whether from shadows, light, wind or muscle–is something I attempt to capture in my art. Colors, shapes and sound stimulate ideas in me. I react viscerally to the beauty of light as it mixes and weaves and pushes and pulls colors as the colors influence each other. My favorite media are oils and encaustics (fused beeswax). Oil paints can quickly capture the changing natural light when painting outdoors, offer rich colors, and are versatile from fine detail to expansive gesture. Encaustics offer great potential for layering, texture and wonderful luminescence. The smell of beeswax brings nature indoors for me.